Iceland is a volcanic island in the North Atlantic Ocean, slightly below the Arctic Circle. The island is situated on a mid-ocean ridge at the boundary between the North American plate and the Eurasian plate. In Iceland, we find evidence of horizontal movements, in which two plates spread apart as the crust dilates with intrusion of new magma. 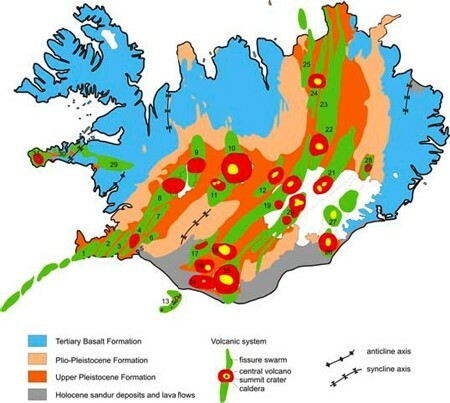 Iceland, however, is also associated with a mantle plume (a narrow stem of upwelling of magma from deep in the mantle) that has maintained volcanism high and vigorous . Spreading creates some sort of symmetry in the buildup of the island (although slightly distorted by the mantle plume) with the youngest rocks situated on the ridge and the older rocks away from the ridge on both sides (Figure 1). Figure 1: A simplified map of the geology of Iceland showing the spreading ridge in orange and the volcanic systems where volcanism takes place. Older volcanic terrains lie on both sides of the ridge. From https://www.soest.hawaii.edu. The rocks forming the island are mostly stacks of solidified lava flows. The lava flows are inclined towards the spreading ridge, exposing a continuous sequence of lava flows that date from the middle Miocene to the present. In the oldest part of the sequence, found in the glacially carved fjords of eastern and western Iceland, the lava flows are intercalated with sediments and deposits with plant remains of large trees not found in Iceland today . Continuing upwards in the sequence, we find volcanic products and sediments that are linked to the Ice Age (Plio-Pleistocene) , and then on top of the sequence at the ridge we find young lava flows and sediments formed after the Ice Age (Holocene). The earliest volcanism in Iceland is regarded as being mostly of so called flood basalt type, that is, large outpourings of magma from fissures, forming lava flows that covered widespread areas , . Around the world, we find several provinces with flood basalts that indicate events of great turmoil in earth’s mantle in the past. Some of these lava flows in these provinces have volumes 100’s to 1,000’s of km3. These events are difficult to explain in conventional uniformitarian terms, but fit well into catastrophic creationist models e.g. ,  that place this volcanism in conjunction with the biblical Flood and its aftermath. Flood basalt volcanism has only recently caught the attention of scientists, and ongoing volcanic activity in Iceland could help in deciphering the effects of such colossal volcanism. For example, the eruption of Laki in 1783-84, which is regarded by many geologists as a small flood basalt eruption, created a lava flow field of about 15 km3 in 8 months (common sizes of modern eruptions are <0.1 km3), and released about 120 million tons of sulfur dioxide (about three times the annual industrial output in Europe in 2016), triggering temperature drops in Europe of about 1-3°C , . The cooling resulted in bad winters and summers leading to poverty and famine in Europe and the death of thousands of people , while famine and fluoride poisoning of the surface waters in Iceland caused the death of over 50% of the livestock. The 2010 eruption of the Eyjafjallajökull volcano was observed to trigger algae blooms under the ash plume , while elevated levels of sulfuric acid, HCL, HF, and metal concentration were measured in snow and precipitation in the Holuhraun eruption in 2014-15 . Furthermore, although not an observation from Iceland, volcanic emissions of CO2 can result in artificial radiocarbon ages (excessively old ages) caused by excess CO2 concentrations in the volcanic grounds . These examples demonstrate that the secondary effects of volcanic eruptions can be many, and we expect the environmental pressure of the flood basalt volcanism around the world in earth’s past history to have been enormous, something that creationists should explore in light of the volcanism associated with the biblical Flood and its aftermath. Iceland has a wide variety of volcanic products, created in volcanic events ranging from effusive lava outpourings to explosive eruptions . Considering that the largest glaciers in Europe are found in Iceland, some of the volcanic eruptions in Iceland occurred and will occur under glaciers (Figure 2). Figure 2: A view over Landmannalaugar in central south Iceland. The thick rhyolite lava flow centered in the photo (see cars on campsite for scale) is named Laugahraun and erupted around 1477. The light colored mountains surrounding Laugahraun are also of rhyolitic composition but are from eruptions under ice during the ice age. When magma erupts under water/ice it fragments generating tephra and volcanic breccia, which reworked and remobilized in the water form volcanic sediment deposits . Later, these deposits are modified and hardened by hydrothermal alteration and become what geologists call hyaloclastites. Thus, hyaloclastite deposits preserve evidence of transport by currents and gravity flows indicative of relatively rapid formation within the watery environment of these subglacial eruptions. The process of alteration in the hyaloclastites was thought to require a long time but took only a few years to happen in Surtsey Island that emerged from the sea in an eruption in 1963-67 . Therefore, subglacial eruptions may be a good analogue to very dynamic, high-energy watery environments with rapid sedimentation, reworking, transportation and hardening of sedimentary deposits. Another interesting phenomenon observed in Iceland is the generation of large volumes of meltwater with geothermal activity and volcanism under glaciers. These meltwaters can burst in high-energy catastrophic flooding events. Outburst floods from eruptions in the glacially covered Katla volcano are estimated to have reached flow rates >200,000 m3/s (which is the flow rate of the Amazon river) . The force of such raging waters carve canyons in hours and leave vast sedimentary flood plains. The canyons of the touristic Gullfoss and Detifoss waterfalls, and the “sandur” deposits (sand plains) in south Iceland are a witness to these glacial outburst floods. Therefore, Iceland provides insight into several geological processes of great relevance to creationists working on developing models for processes that might have occurred during or after the biblical Flood. Going from plate tectonics, the ice age, flood basalt volcanism and its secondary effects, to catastrophic erosion and sedimentation, all these themes are displayed in an unspoiled environment immersed with natural beauty. Bjarnason, I., 2008, An Iceland hotspot saga, Jökull, 2008, 58, 3-16. Denk, T.; Grímsson, F. and Kvacek, Z., 2005, The Miocene floras of Iceland and their significance for late Cainozoic North Atlantic biogeography, Botanical Journal of Linnean Society, 149, 369-417. Geirsdóttir, Á., 2011, Chapter 16 - Pliocene and Pleistocene Glaciations of Iceland: A Brief Overview of the Glacial History, Jurgen Ehlers, P. L. G. and Hughes, P. D. (Eds. ), Quaternary Glaciations - Extent and ChronologyA Closer Look, Elsevier, Volume 15, 199-210. Quarterly Journal of the Geological Society, 1959, 114, 367-391. Oskarsson, B. V. and Riishuus, M. S., 2014, The mode of emplacement of Neogene flood basalts in eastern Iceland: Facies architecture and structure of simple aphyric basalt groups, Volcanol. Geotherm. Res., 2014, 289, 170-192. Austin, S. A.; Baumgardner, J. R.; Humphreys, D. R.; Snelling, A. A.; Vardiman, L. and Wise, K. P., 1994, Catastrophic plate tectonics: A global flood model of earths History, Walsh, R. E. (Ed. ), Proceedings of the Third International Conference on Creationism, 609-621. Baumgardner, J. R., 2003, Catastrophic plate tectonics: The physics behind the Genesis flood, Ivey Jr., R. L. (Ed. ), Proceedings of the Third International Conference on Creationism, 113-126. Wikipedia – The Laki eruption. Grattan, J.; Durand, M. and Taylor, R., 2003, Illness and elevated human mortality in Europe coincident with the Laki Fissure eruption, Oppenheimer, C.; Pyle, D. M. and Barclay, J. (Eds. ), Volcanic degassing, GeologiGeological , London, Special Publications, 213, 401-414. Achterberg, E. P.; Moore, C. M.; Henson, S. A.; Steigenberger, S.; Stohl, A.; Eckhardt, S.; Avendano, L. C.; Cassidy, M.; Hembury, D.; Klar, J. K.; Lucas, M. I.; Macey, A. I.; Marsay, C. M. and Ryan-Keogh, T. J., 2013, Natural iron fertilization by the Eyjafjallajökull volcanic eruption, Res. Lett., 40, 921-926. Gíslason, S. et.al., 2015, Environmental pressure from the 2014-15 eruption of Bárðarbunga volcano, Iceland, Geochemical Perspectives Letters, 1, 84-93. Pasquier-Cardin, A.; Allard, P.; Ferreira, T.; Hatte, C.; Coutinho, R.; Fontugne, M. and Jaudon, M., 1999, Magma derived CO2 emmisions recorded in 14C and 13C content of plants growing in Furnas caldera, Azores, Journal of Volcanology and Geothermal Research, 92, 195-207. 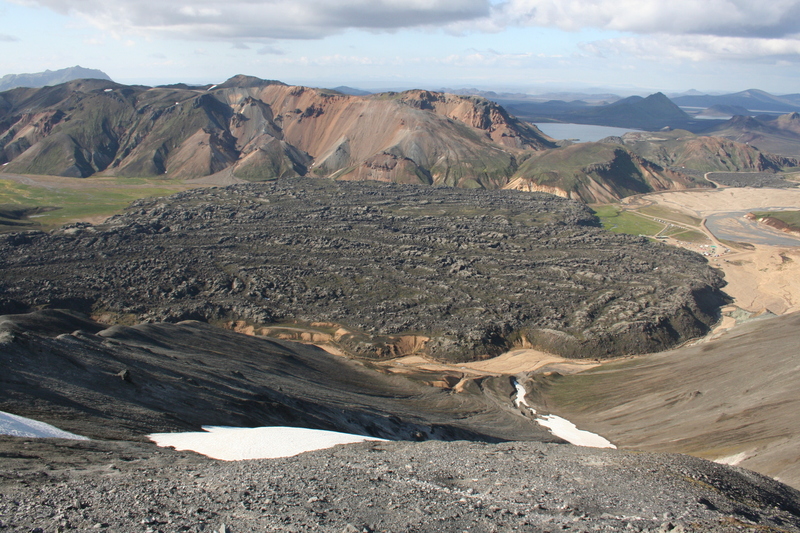 Thordarson, T. and Larsen, G., 2007, Volcanism in Iceland in historical time: Volcano types, eruption styles and eruptive history, Journal of Geodynamics, Hotspot Iceland, 43, 118-152. Schopka, H. H.; Gudmundsson, M. T. and Tuffen, H., 2006, The formation of Helgafell, southwest Iceland, a monogenetic subglacial hyaloclastite ridge: Sedimentology, hydrology and volcano-ice interaction, Journal of Volcanology and Geothermal Research, 152, 359-377. Jakobsson, S., 1972, On the consolidation and palagonitization of the tephra of the Surtsey volcanic island, Iceland, Surtsey Research Progre. Rep. VI, 121-129. Tomasson, H., 1996, The jokulhlaup from Katla in 1918, Annals of Glaciology, 22, 249-254.